Payments on smartphones via the mobile internet will boost global online retailers. The entry of OS-Pay (Apple Pay and Android Pay) to the market is likely to play an important role in retailer business strategy, according to the latest market study by Juniper Research. Moreover, with biometric authentication becoming more common as a means of avoiding password or PIN entry, purchase friction can be further reduced. New findings from the Juniper study indicate that the value of digital and physical goods purchased through mobile 'OS-Pay' platforms will increase by fifteen times in the next two years. 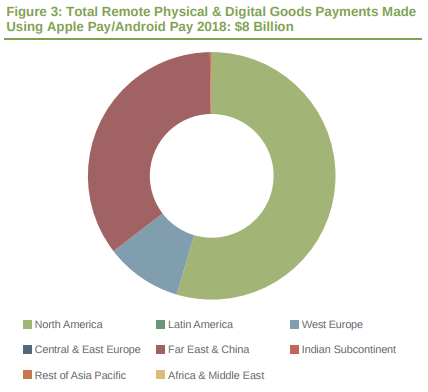 A combination of in-app purchases and website retail payments is projected to drive worldwide annual spend via Apple Pay and Android Pay to $8 billion in 2018 -- that's up from just $540 million this year. Their study also found that the integration of OS-Pay into North American eRetail apps will be welcomed by software developers looking to reduce buyer friction, where password entry on smartphones remains cumbersome. Staples, the office supply retail chain, has already reported that over 30 percent of its Apple iOS app users make in-app purchases through Apple Pay. Meanwhile, despite the continued contraction of the consumer media tablet market, which is currently dominated by Google Android devices, more than 85 percent of remote goods payments are forecast to be made using the mobile internet by 2021. "It is clear that even in markets where PCs and laptops have a high installed base that the smartphone is playing an increasingly important role where remote goods purchases are concerned." said Steffen Sorrell, senior analyst at Juniper Research. "For merchants, this means that the buyer experience must be made as frictionless as possible -- from product search and discovery to purchase." Apple has recently signaled its intent to offer Apple Pay to online merchants by the end of 2016, offering a similar payment mechanism to PayPal. According to the Juniper assessment, this move will likely benefit most merchants, as long as integration into their storefronts is made simple and rates are competitive. Meanwhile, Juniper expects the entry of Android Pay into this space once further country expansion has been achieved. This will no doubt boost the market further in terms of merchants who may have been undecided where Apple Pay is concerned. These OS-Pay solutions are likely to pose a threat to PayPal’s Western dominance, although Juniper does not anticipate that combined sales via Apple Pay and Android Pay will approach those via PayPal within the next 5 years.